Two injured umpires have returned to play following the 2017 All-Star Break, while a third remains absent. 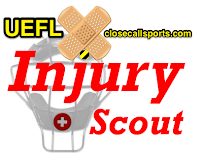 2017 1st Half Injury Scout Review. Kerwin Danley (head): Having left the July 9 Royals-Dodgers game in the 2nd inning as the result of a foul ball-head injury, Danley returned to play on Friday in Milwaukee, effectively missing no games as the result of his injury due to the four-day All-Star Break. Andy Fletcher (head): After leaving June 21's Diamondbacks-Rockies game in the 7th inning after taking a deflected hit-by-pitch to the mask, Fletcher returned to play on Friday in Detroit, closing out a 22-day absence from the field. Dale Scott (head): The only remaining umpire on staff who has not returned from injury, Scott's most recent umpiring appearance was April 14 in Toronto, when he was carted off after a foul ball head injury. CT scans were reportedly negative and Harold Reynolds reported a concussion had been diagnosed. CB Bucknor (lower body): Bucknor briefly left the field June 2 after motioning toward his right leg and hamstring area. Though he was off the field for a few days following the apparent leg injury, he returned to the field on June 13. Tony Randazzo (head): Hit in the head during the 5th inning of May 13's Reds-Giants game, Randazzo didn't leave the field until the game entered the 14th inning. He returned to the playing field after a 28-day absence, on June 9. CB Bucknor (head): Before June 2, Bucknor had left his April 28 assignment due to a foul ball head injury, returning to play after a 13-day absence, on May 12. Jeff Nelson (undisclosed/preseason): On March 14, Jeff Nelson left his Spring Training assignment in the middle of the 4th inning for an undisclosed reason, returning to the field on March 17. Bruce Dreckman (return from pre-existing absence/preseason): Bruce Dreckman concluded his 522-day absence from the field when he officiated his first Spring Training game on March 10. David Rackley (head): A foul ball facemask/head injury on March 5 sidelined Rackley for three days before his return to play on March 9. Paul Emmel (upper body): Emmel was struck by an accidentally thrown bat on February 28, and returned to action on March 2, after just one day off the field. [Undisclosed Reason for Absence]: Brian Knight has been missing from the field since June 13, 2017. He previously was absent from May 15 - June 11.